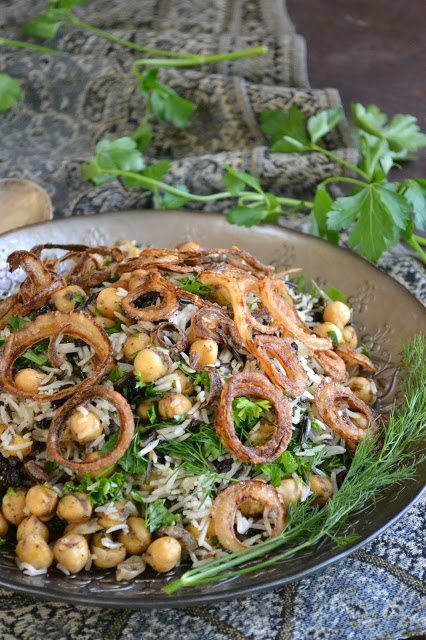 This Basmati and Wild Rice with chickpeas, currants and herbs is a naturally vegan and gluten free rice pilaf, and makes a stunning side dish or hearty vegetarian main course. I’ve been going crazy for Indian and Middle Eastern rice dishes lately. This one, from my new cookbook Jerusalem, had me right from the title. Each nutty grain of basmati rice is separate, but not dry, the chick peas are spiced and creamy, the wild rice, chewy, and the tiny little currants pack a sweet zing. And the title doesn’t even make mention of those insane crispy fried onions on top. Have mercy. This certainly looks festive enough for celebrations or entertaining, but I see it as an everyday vegetarian main course. Or, make it on Sunday and brown bag it for lunch all week. Heck, I ate it for breakfast. My appreciation for basmati rice is growing by leaps and bounds. I love its firm texture, I love the nutty aroma. It all started with my Indian Style Basmati Rice, and then there was my Persian Jeweled Rice, and finally this Saffron Rice. This dish has a completely different vibe going on, though. 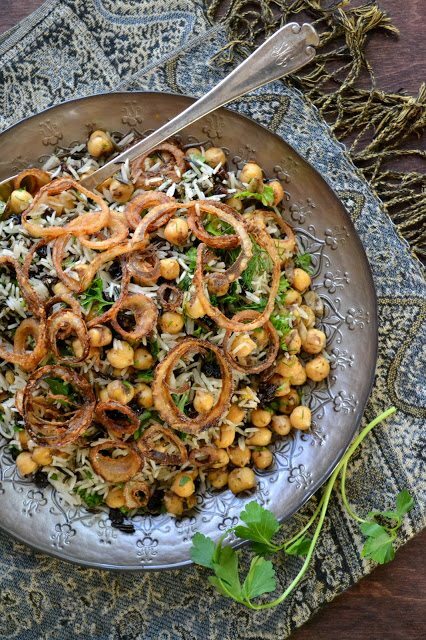 Fried onions, chick peas, currants and fresh herbs replace the saffron, pomegranates, dried fruits and nuts in the other recipes. The funny thing is, I’ve never been much of a rice eater. I grew up on Minute Rice. I imagine that’s why I never order rice as a side dish and still to this day I think of it as flavorless, boring, ‘filler’ calories. My foray into these Middle Eastern and Indian recipes has changed all that and I’m starting to appreciate that rice can be the exciting centerpiece for a meal. I made a few minor adjustments to the recipe which I was happy with, so I noted those in red. I used a little more wild rice (which isn’t really a rice at all, it’s a grass) and reduced the amount of basmati rice because I wanted a chunky, satisfying main dish with a high ratio of other ingredients to white basmati rice. This is the second vegetarian/vegan and gluten free recipe I’ve posted this week—I don’t seek them out or formulate them on purpose to be vegan or gluten free, but I’m trying to notice when they happen that way. I’m also trying to be more conscious about throwing gratuitous bits of animal protein, especially cheese, into recipes when it’s not really necessary. Cover the wild rice with plenty of water and bring to a boil in a small saucepan. Simmer for about 40 minutes, then drain and set aside. To cook the basmati rice, pour a tablespoon of the olive oil into a medium saucepan with a tight fitting lid and heat on high. Add the rice and 1/4 tsp of salt and stir to combine the rice and oil. 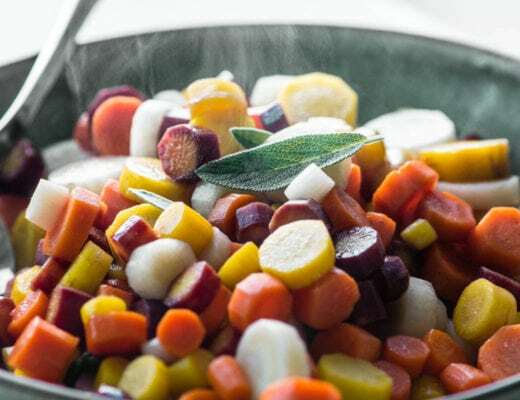 Carefully add in the boiling water, lower heat to very low, cover, and let cook for 15 minutes. Remove the pan from the heat, remove the cover, lay a clean towel over the pan, re-cover, and let sit for 10 minutes. Heat the remaining 1 1/2 Tbsp olive oil in a saucepan over high heat. Add the cumin seeds and the curry, then the chickpeas and 1/4 tsp of salt. Stir fry the chickpeas for a couple of minutes, then transfer them to a large bowl. Wipe out the pan and pour in the safflower oil. Heat until very hot. Toss the onions with the flour, separating the onion rings as you do. Check to see if the oil is hot enough by dropping an onion in. It should sizzle vigorously. Dust any excess flour off the onions and fry them, in batches, until deep golden brown. This should only take a couple of minutes. Set the onions on paper towels to drain. 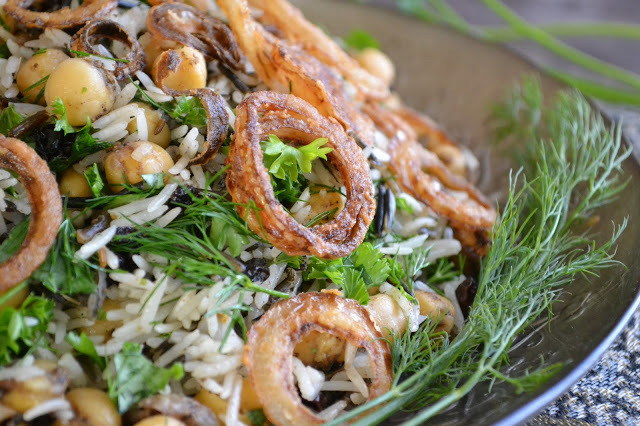 Mix the two rices, the chickpeas, currents and herbs together in a bowl. Add salt and pepper to taste, and top with the fried onions. Serve warm or at room temperature. Don’t forget to pin this Basmati and Wild Rice Pilaf! I over boiled the basmati! Can it be saved? This is truly better than the sum of its parts. I have owned the Jerusalem cookbook for years and am an Ottlenghi fan-girl, but had never made this. I took your idea of garam masala vs. curry – it’s a good one. I added a dollop of Greek yogurt (thus missing the mark on keeping it vegan) and a sprinkle of sumac. This has has that comfort casserole-y thing that kept us coming back for more. He’s pretty much a genius, isn’t he? Sadly I used the wrong kind of rice, not so sadly, it still came out absolutely delicious and I’ve had to stop myself from going and eating more because I am fully stuffed. I added a few more chickpeas to up the protein content a bit and served with some greens. The flavour combination is unreal! Three of my favourite herbs, a warming blending of spices and the sweetness from the currents… Perfection! This really is a spectacular dish, I’m so glad you liked it Alicia. You’ll have to get some basmati for your next try! Absolutely loved this recipe!! It’s a favorite in our household, my daughter has celiac disease, normally I would make this with gluten free flour but this last time I made it without. We couldn’t detect a difference. The balance of flavors makes this extremely satisfying. Thanks Sue, for doing the favor finding for me! You’re so welcome Suzanne, it’s such a pleasure for me to share Ottolenghi recipes, so many people would never come across them otherwise. This one is one of our favorites too! Would you recommend making part or all of this one day in advance? I have a large group coming over for dinner and very little time to prepare. I think this could be made and reheated, Heather, rice does pretty well if gently reheated, covered in foil. You might add extra fresh herbs just before serving in that case. This looks like a great dish. It is NOT gluten-free with the all-purpose flour, but you could definitely substitute a GF all-purpose flour. Maybe add a note as those who might consider making this dish for a gluten-free friend would end up making their friend very sick with this recipe. Great point, I updated that. The amount of rice in the book I believe is an error, since 220g of rice is about 1 1/4 cups, not 2 1/4 cups. I made the dish exactly as in the book, except reduced the amount of basmati rice and I thought it was outstanding! I think it’s an error, too. I made the full amount and it was way too much. What a wonderful combination of ingredients! The onions on top really does it for me. Beautiful! The onions really made the dish! I just stumbled upon your page and the photos are just breathtaking. You such a wonderful job…not to mention the recipe looks amazing as well. So happy to have found you. Glad you found me, Julia. I love this recipe, and will be making it for years to come. I don’t eat a ton of meat, either, and I particularly love the rice on its own. I will say, tough, that the chicken cooking in the rice adds a lot of flavor, so I might use chicken stock when making the rice on its own. 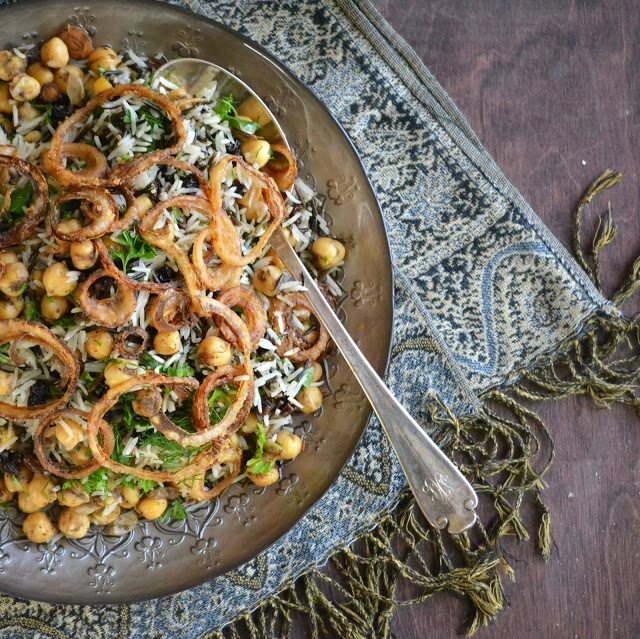 No surprise here, but I LOVE this dish (says the Middle Eastern food blogger, ha). Yotam Ottolenghi and Sami Tamimi are two of my favorite people on earth for bringing MidEastern cuisine to public consciousness in such a beautiful, beautiful way. You’ve done such a great job with this dish – looks totally authentic. Love it! Thanks Yasmeen, that means a lot coming from you. 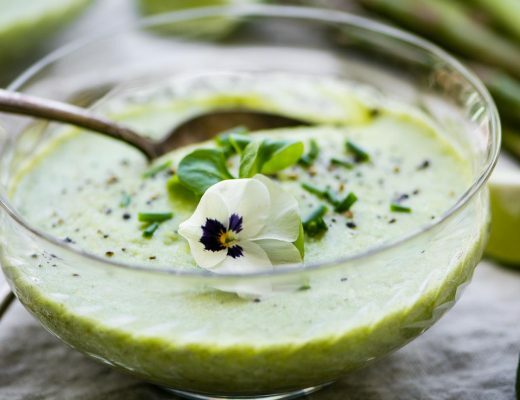 Your right a meal in itself – and hey there is nothing wrong with having this for breakfast! Basmati rice is just the best and we buy it “aged” which is even better, ask about that in your indian grocers a bit more expensive but you can taste the difference. We eat rice several times a week with one thing or another – my mother always baked it under pork or baked it with milk and sugar as a pudding – love it. I’ve recently discovered authentic basmati rice and it is so incredible. Actually they have so many varieties at our local Indian market that I just randomly choose one and each time it’s different but sooo good. Hey, I had this one marked to try too!! Those crispy fried onions on top pulled me in immediately. I love the sound of it all together. 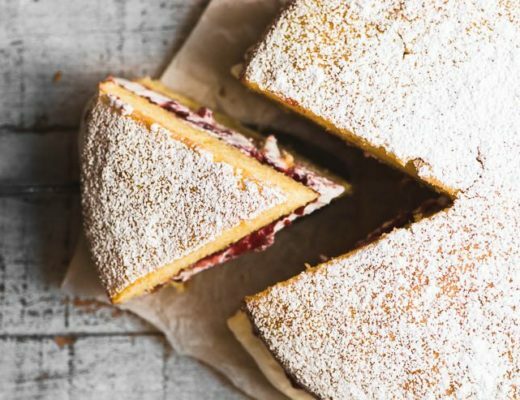 Not only does the recipe sound amazing, the food styling is just gorgeous, Sue! I want chickpeas for breakfast now! The food looks like it belongs on the pages of Jerusalem! A stunning dish indeed! I love everything about it and now I want to buy more Basmati rice. Thanks for this lovely trip to Jerusalem. I have an endless supply of the rice because I bought a giant burlap sack of it, imported from India, at my grocery store, I was amazed they had it.